The largest selection of roller skates at the best prices. Welcome to RollerSkateNation.com! Our goal is to be the best place online to buy roller skates by providing our customers with a better skate selection, superior customer service, and competitive prices. You have found the place to go to shop for brand name quality roller skates at unbeatable prices. This roller skate shop is staffed with skaters who are the expert on skates and who are determined to share the joy of roller skating with the world. We believe that trust with our customers is of great importance, so you can expect a great selection of skates, knowledgeable staff members, speedy delivery, and very affordable prices when you buy roller skates online from us. Roller Skate Nation was founded by Adam Lean who has been around the skating industry virtually all of his life. He believes that roller skating is "...one of the best ways that we can interact with friends and family, getting much needed exercise, and all the while having a lot of fun". Based in Columbus, GA, RollerSkateNation.com prides itself in serving its' customers with top of the line roller skates at the very best prices. Adam Lean is our founder! He has been around skating practically all his life and is passionate about making people happy. 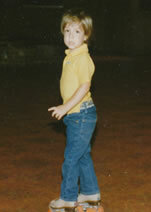 This is him at 3 at his hometown rink. Adam has many years experience with running skating rinks and selling roller skates. Lauren grew up in the Chicago area, and has spent much of her life traveling the world and experiencing new cultures. When she isn’t busy canoeing the rivers of France, she enjoys skating at her local rink or being pulled behind her dog, Benson! Lauren has always been a big fan of Riedell, and loves her 495 boots! Elise played roller derby for 3 years in Dallas, TX. She was on several home teams and played on both travel teams during her time skating there, even getting to beat their "never beat by them cross-town rivals" during a tournament weekend, by far one of her favorite derby moments. She "retired" after a knee injury made her. Elise still loves skating recreationally with her step-daughters and on area park trails. She did also just start learning ice and roller hockey. "I just wanted to say THANK YOU!! I ordered my red Rebel Skates on July 2nd, and received them on July 6th. We live in Germany!! I was so impressed at how fast I got them. Yesterday I finally got to try them out at the rink and I LOVE THEM !!!! They fit fabulously and they are very comfortable. I'm looking forward to showing them off to my fellow derby girls and making them jealous! "Thanks for the quick response and the info!This is my third order and I love the products, prices, delivery, service, etc."